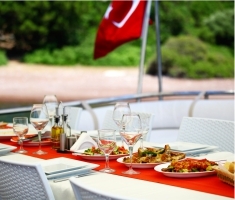 Blue Guide is both a business and an inspiration, dedicated to yachting and blue cruise charters in the western Med of Turkey and Greek islands. New to the yacht charters and Blue Cruise concept ? Our info pages compare the three different ways to book a yacht: a fully crewed private yacht charter, a skippered bareboat charter or a cabin charter. Cruises from Bodrum, Marmaris, Gocek, Fethiye and Antalya to share the remarkable experience of the Blue Voyage with your family or friends. 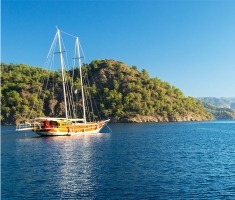 Incentive yacht tours on a fully crewed private gulet with no fixed itinerary on the classical routes with modifications to accommodate individual schedules or desires. 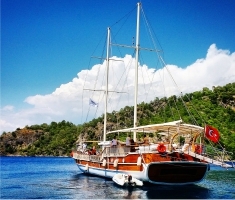 Charter your private Gulet to share the remarkable experience of the Blue Cruise with your family or close friends. Incentive yacht tours with no fixed itinerary, following classical routes with modifications to accommodate individual schedules or desires. Cruise your cares away and start making new friends of your fellow voyagers! If you cannot get a group together so as to take your own yacht, you still have the opportunity to join one of our cabin charter voyages. Apart from private charters, we also offer ..